Gilbert Keith Chesterton, KC*SG (29 May 1874 – 14 June 1936), better known as G. K. Chesterton, was an English writer, poet, philosopher, dramatist, journalist, orator, lay theologian, biographer, and literary and art critic. Chesterton is often referred to as the "prince of paradox". 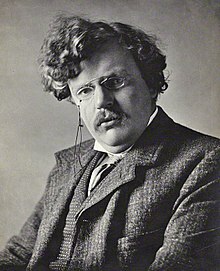 Time magazine has observed of his writing style: "Whenever possible Chesterton made his points with popular sayings, proverbs, allegories—first carefully turning them inside out." What the world wants, what the world is waiting for, is not Modern Poetry or Classical Poetry or Neo-Classical Poetry - but Good Poetry. And the dreadful disreputable doubt, which stirs in my own skeptical mind, is doubt about whether it would really matter much what style a poet chose to write in, in any period, as long as he wrote Good poetry.